A Pakistani commission investigating the US raid that killed Osama Bin Laden has said the government should not allow his family to leave the country. Three of Bin Laden's wives and several children were detained after the 2 May raid on a compound near Islamabad. The commission is investigating how the al-Qaeda leader hid in the Abbottabad compound for nearly five years. It held its first meeting on Tuesday. It is not clear whether the authorities will heed the commission's demand. 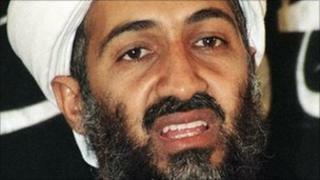 Bin Laden, 54, orchestrated the 9/11 attacks on New York and Washington in which nearly 3,000 people died. He evaded the forces of the US and its allies for almost a decade, despite a $25m (£15m) bounty on his head. The family are said to have provided vital information about the al-Qaeda leader's activities and are among the main witnesses of the covert US operation that killed him. The BBC's Shahzeb Jillani says that their testimony is considered crucial for the commission's efforts to investigate Bin Laden's presence in Pakistan and the circumstances surrounding the US raid. The commission, headed by a senior judge of the Supreme Court, has ordered the interior ministry and the main intelligence agency, the ISI, to make sure that Bin Laden's family does not leave the country without its permission. Our correspondent says that the US raid infuriated many Pakistanis and prompted suspicions that the al-Qaeda leader could not have been hiding in Abbottabad for nearly five years without the knowledge of the country's armed forces. Pakistani officials have since called it one of their biggest intelligence failures. Many in Pakistan are now hoping that the commission - whose meetings are not open to the public - will come up with some real answers. A statement issued by the commission promised a thorough investigation and said it would summon senior civilian and military leaders to attend proceedings if necessary. "Their identity will be kept confidential and they will also be legally protected," Associated Press quoted the statement as saying.